Homann Heirs map of the Strait of Gibraltar from an unusual southern orientation. Carte Topographique des Pays et Côtes Maritimes Qui Forment le Détroit de Gilbraltar / Topographische Carte der Länder und Küsten welche die Meer-Enge von Gibraltar. 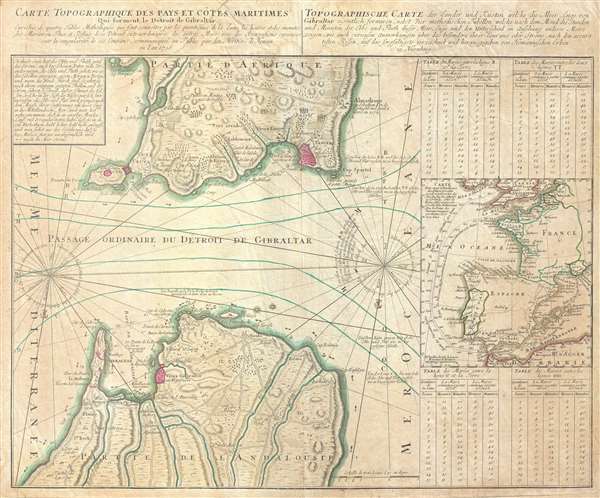 This is a 1756 Homann Heirs map of the Strait of Gibraltar. The map is oriented to the south, thus depicting the Strait from Morocco to Spain, labeled Andalusia (Andalousie). Both Spain and Morocco are illustrated in detail. Different locations are noted in both countries, including guard towers, castles, and cities, such as Tangiers and Gibraltar. Fields, forests, hills and sand dunes dot the landscape, and rivers and roads traverse the land on both sides of the Strait. It is interesting to note that, along with the Port of Tangiers, the mosque in the city is also labeled. A surprisingly detailed inset map is located along the right border. This map depicts western Europe, from Britain and Ireland to the Strait of Gibraltar and North Africa. The countries of Spain, Portugal, France, Belgium, and England are illustrated in detail. Numerous cities are labeled, including Paris, London, Madrid, and Lisbon. Both France and Spain are divided into different regions, at least along the coast. Both Majorca, Minorca, and Ibiza are labeled. Shipping routes between England and southern France are depicted as well, with distances noted every twenty miles. Four tables are also included along the right border. These tables provide information on the tides in and around the Strait of Gibraltar and the Mediterranean Sea. Notations on this map are in two languages. The vast majority are in French, while some are in German. This map was produced by Homann Heirs in 1756. Very good. Light soiling. Closed tear extending 6 inches into printed area professionally repaired on verso.